Fieldlens reports are built from the posts that you and your team create over the lifespan of any project. So as you walk the jobsite creating observations, documenting issues, assigning due dates, making punch lists, etc, Fieldlens will use that information to run a report -- whether you’re creating your dailies or sending out meeting minutes. Fieldlens offers a number of preset report formats, but you can also customize your PDF reports to your specific requirements. How do I customize my report? To customize a report, first click on the Export report button at the top of any project Feed. Here you’ll be able to filter through the post details included in your report, as well as give it a title, select recipients, or run your report on a schedule. Click the pencil icon next to Format and then select Customize to the right of the Layout drop down menu. Here you’ll see the full range of options as to what information to include or exclude from your report. The Cover options section allows you to make changes to the first page of your report. Filter criteria - the types of posts you’re including. Post stats - the number of open, resolved, closed, past due and unassigned posts. General Notes - any additional information relevant to the report not included in your posts. A page break after the cover content. Choose to add or remove full-size drawings pages within General options. Simply check or uncheck the box to the left. 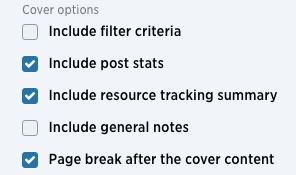 Post options allow you to control the amount of details from your project posts that end up in the report. Choose to include as little or as much detail as you would like by checking or unchecking the boxes on the left hand side of the menu. To omit the post data altogether just leave the box next to Post details unchecked (to just send the cover page summary, for example).